Powerful Performance: The CRF1000L Africa Twin’s 1,000 cc parallel-twin fuel-injected engine draws heavily from Honda’s winning off-road racing bikes, including the CRF250R and CRF450R. Engineered to perfection: Four-valve Unicam cylinder head design has numerous performance benefits – including lighter weight and reduced gyro effect – while also contributing to the engine’s compact dimensions. A lightweight camshaft – using the same materials as the CBR1000RR’s camshaft – operates the valve train. Dual spark: Twin sparkplugs in each cylinder help to produce rapid, thorough combustion. Distinctive sound and feel: A 270-degree phased crankshaft gives the engine a distinctive sound and feel – almost like a V-twin – while helping to produce strong and linear power and instant response anywhere in the rev range. There’s a deep growl as the RPM rises that will be music to any motorhead’s ears. Clever design integration: The dry-sump oil system with internal tank reduces engine height. Combined with the Unicam cylinder head and other design elements, this contributes to an extremely low engine height, which in turn results in generous ground clearance. Lightweight architecture: The water pump is housed within the clutch casing, and the water and oil pumps are driven by a shared balancer shaft, all of which reduces engine size and weight. Maximized airflow: Forward-mounted air intakes feed a large airbox. Dual air filters can be changed without removing fuel tank, and the system is designed to minimize the risk of dirt or other debris entering the engine when servicing the filters. Dynamically responsive: The six-speed manual gearbox is both lightweight and robust – it uses the same shift-cam design as found on the CRF250R and CRF450R to ensure positive changes. An assist slipper clutch helps to maintain traction during downshifts or deceleration. Innovative functionality: The Africa Twin is also available with Honda’s advanced Dual Clutch Transmission (DCT). It features the standard manual mode – allowing the rider to shift gears with triggers on the left handlebar – and two automatic modes. D mode offers the best balance of fuel economy and cruising comfort, while S mode cranks up the performance. S mode even allows you to choose from three different shift patterns to match your riding style or the conditions. Exceptional versatility: The Africa Twin’s DCT is specially engineered to handle off-road adventures, thanks in part to the G switch positioned on the right side of the instrument panel. Pushing the G switch in any riding mode provides an aggressive shift pattern that’s ideal for breaking the rear wheel loose in a sweeping dirt or gravel corner, or lofting the front wheel over an obstacle. Breakthrough technology: Another benefit of the Africa Twin’s DCT is incline detection. Algorithms based on vehicle speed, engine speed, throttle input, and more, determine if the bike is ascending or descending a slope, and the system’s ECU selects the appropriate gear for climbing or engine braking. Torque control: The Africa Twin even allows you to select from various levels of traction control. The Honda Selectable Torque Control (HSTC) system adjusts the allowable rear-wheel slip through 3 levels (or off). 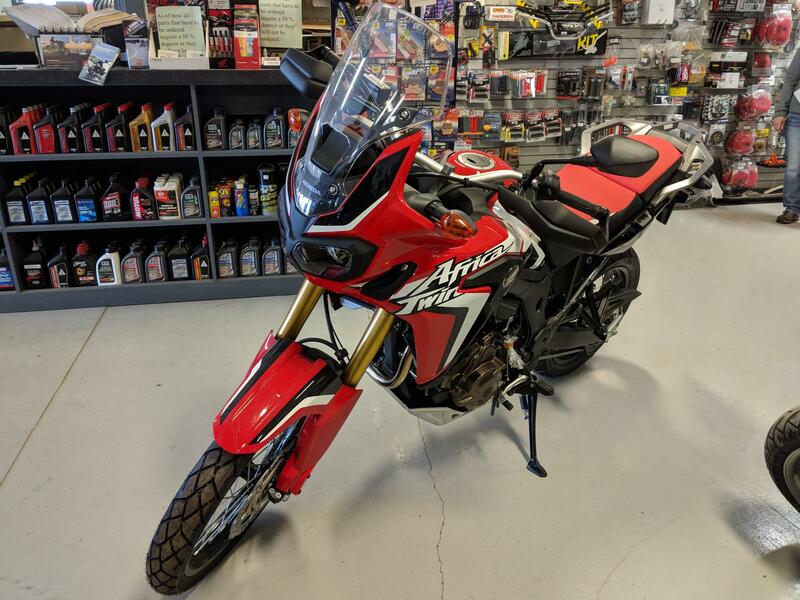 Perfected dual-purpose design: The Africa Twin’s chassis is engineered to handle the most rugged off-road adventures, while also providing the comfort of a touring motorcycle and the everyday competence of a great all-rounder or day-to-day commuter. Strength and agility: The semi-double-cradle steel frame uses oval-shaped tubing for extra strength without extra weight. Balanced handling characteristics: Careful attention to mass centralization – with heavy items like the battery packaged at the rear of the cylinder head – contributes to agile handling. Nimble handling and tight control: The chassis design allows for superior manoeuvrability, with a wide 43-degree steering angle and a tight 2.5-metre turning radius. Superior suspension dynamics: The long-travel Showa 45 mm inverted fork offers full spring preload, compression damping and rebound damping adjustment, and was designed specifically for a leading-axle wheel and radial-caliper mounting. Engineered functionality: The Africa Twin’s Pro-link rear suspension design positions the shock lower at the front of the aluminum swingarm, lowering C of G even further and allowing designers to keep the seat/tank area above the shock as slim as possible. Selectable suspension: The Showa rear shock’s hydraulic dial-style preload adjuster, combined with full adjustment for compression and rebound damping, makes it easy to change suspension performance to suit street or dirt riding. 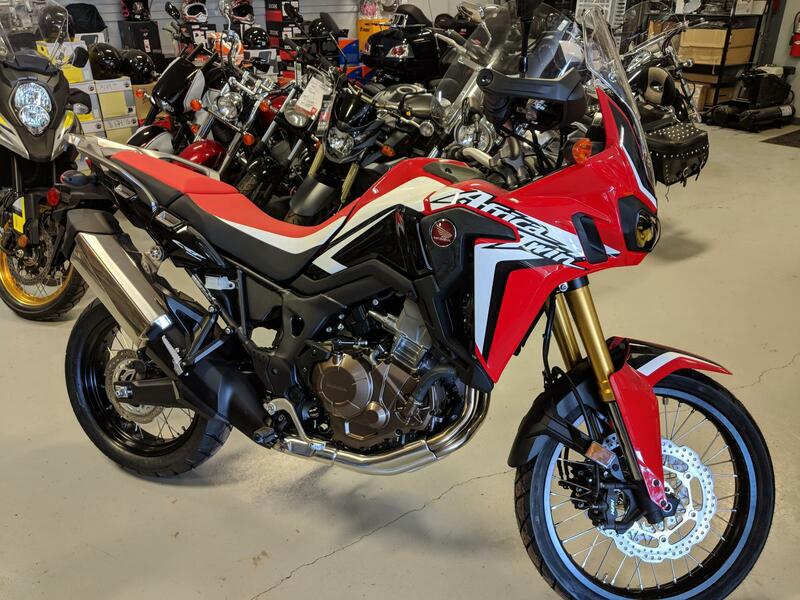 Adventure ready: Like the CRF450R Rally, the Africa Twin uses 21-inch front and 18-inch rear spoked wheels, wearing 90/90-21 and 150/70-18 tires. Superb braking system: Dual front radial-mounted Nissin four-piston brake calipers and 310 mm wave-style floating rotors provide strong braking force on pavement or dirt. Proven Performance: Standard ABS provides confident braking control on all types of surfaces. The Africa Twin’s Adaptive Rear ABS Cancelling allows you to disable the rear-wheel ABS – a benefit in certain types of off-road riding. The system reverts to normal operation when the engine is restarted. Durable construction: Following its design theme of “unlimited adventure”, the Africa Twin is styled with a minimum of bodywork in a tough, lightweight form that offers both weather protection for the rider and a slim, agile feel. Distinct styling cues: Dual LED headlights give the Africa Twin an imposing presence while providing excellent nighttime illumination. Ergonomic seating adjustment: A wide seat at the rear tapers to narrow at the front, which provides extra comfort when sitting plus an easy transition to standing when off-road. The seat can be raised or lowered through a range of 20 mm. Excellent range capacity: A large 18.8-litre fuel tank, coupled with the engine’s excellent fuel efficiency, provides a range of up to 400 km. Enhanced comfort and stability: Off-road-style tapered aluminum handlebar is strong yet lightweight, and is rubber mounted for reduced vibration. True adventure design: An aluminum skid plate helps protect against damage from stones, rocks and other obstacles. Advanced instrumentation: White-on-black LCD instrument panel is mounted high for easy legibility, even when standing. Attractive colour combinations: Choose from three colour options: CRF Rally, Tricolour Red/White/Blue and Candy Red. Brakes: Front: 310 mm dual wave floating hydraulic disc with aluminium hub and radial fit 4-piston calipers and sintered metal pads; Rear: 256 mm wave hydraulic disc with 2-piston caliper and sintered metal pads. 256 mm wave hydraulic disc with 2-piston caliper and sintered metal pads.